While average housing prices continue plateauing QoQ, Pune witnessed an improvement in buyer sentiment for residential belts near IT/ITeS hubs. Proximity to premium office markets, limited land availability, lifestyle changes and planned development drove housing demand to these areas. Fringes, which attracted investors in FY 2015-16, have started losing their charm due to slow pace of infrastructure development. Enquiries for affordable projects in these areas, thus, posted a decline. Some improvement, however, is anticipated in the festive season in Oct-Dec 2016. 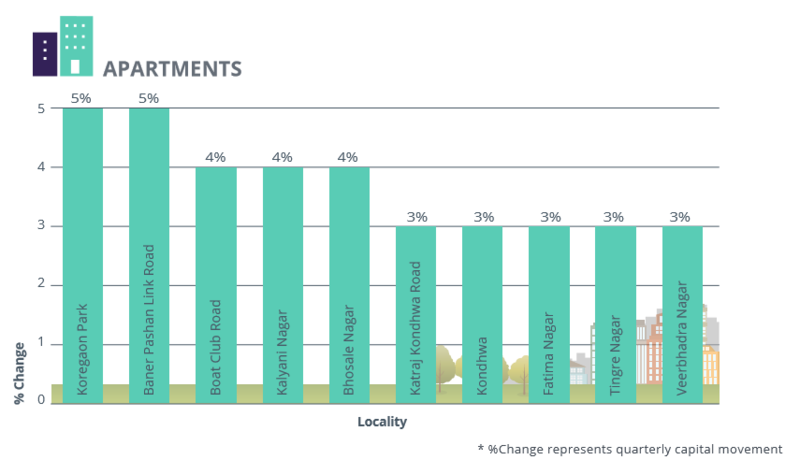 Baner-Pashan Link Road and Koregaon Park led the market with five percent increase in average capital values, QoQ. While the former benefitted from its proximity to IT hubs, housing prices in Koregaon Park surged owing to limited residential stockpile. Other premium areas such as Boat Club Road, Kalyani Nagar and Bhosale Nagar marked four percent average capital growth, each, backed by healthy residential uptake from IT workforce and NRIs. Access to employment opportunities, sound physical and social infrastructure and competitive residential pricing as compared to the benchmark location of Viman Nagar, pushed ‘ask’ rates up in Tingre Nagar and Veerbhadra Nagar. Historically popular pockets of Kharadi, Wadgaon Sheri and Hinjewadi reported a decline in the average capital values due to the emergence of affordable housing zones in the neighbourhood. The weighted average rentals in Pune witnessed an uptrend with a four percent rise in the last one year. Close to 60 percent of the tracked localities recorded an upswing in rental values, YoY. 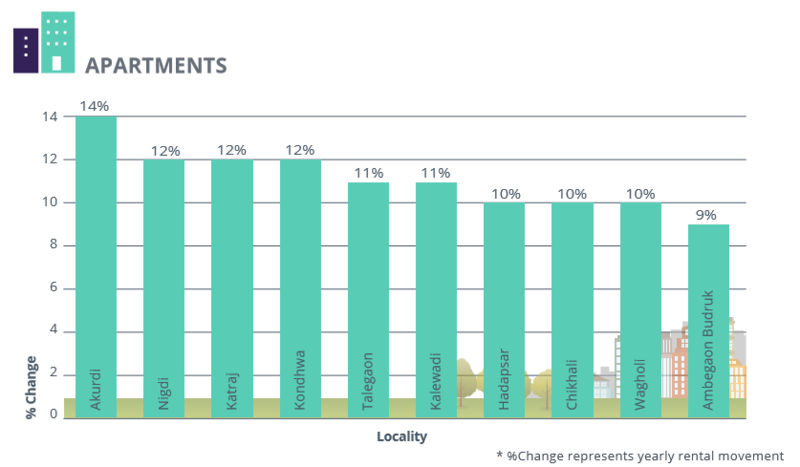 Tenant community, primarily comprising professionals from IT/ITeS, manufacturing and industrial sector, preferred peripheral areas due to proximity to offices and cost-effective stock. Akurdi in the North led the rental market with a colossal 14 percent rise, YoY. Smooth connectivity to Central Pune via an array of roads and flyovers and the presence of several Small and Medium Enterprises drive rental demand here. Following suit, Nigdi, Talegaon, Chikhali registered a rise of 9-13 percent in average rental values owing to their proximity to prime commercial hubs in the city. In the South, rental markets of Ambegaon Budruk, Katraj and Kondhwa magnetised tenants due to smooth connectivity to Magarpatta IT hub, MG Road and the railway station. Rental values in Hadapsar and Wagholi surged on the back of IT/ITeS and retail developments. 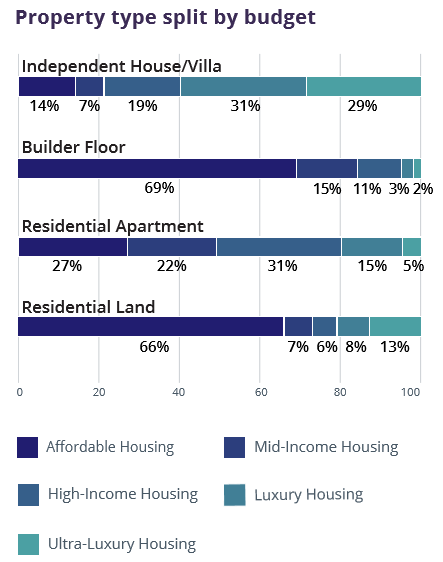 Most of the young working professionals prefer these markets on account of affordability. While capital market in West Pune outperformed other quadrants, rental market remained subdued. Average rental ‘ask’ rates in areas such as Hinjewadi and Kothrud dipped by 3-5 percent YoY on account of piling inventory and higher rentals than neighbouring locations. Limited number of new launches and a demand-supply disequilibrium characterised the residential market of Pune in Jul-Sep 2016. The weak supply pipeline is set to continue into 2017 with most project launches catering to the growing migrants in the city. Presence of end-users led to an exceptionally high demand for apartments. Nine out of 10 homebuyers preferred these over other property types. While the affordable housing segment majorly offered builder floors, residential apartments were primarily available within Rs 60 lakh-Rs 1 crore bracket. 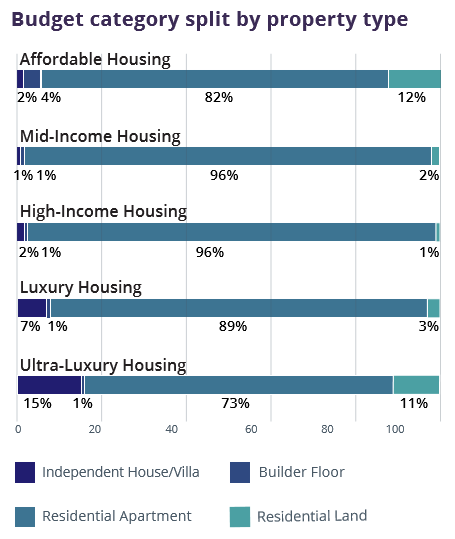 In line with the previous quarters, the highest concentration of independent houses and villas was in the luxury and ultra-luxury segments. Supply of land parcels remained restricted to peripheries with over 65 percent of plotted developments available within Rs 40 lakh. 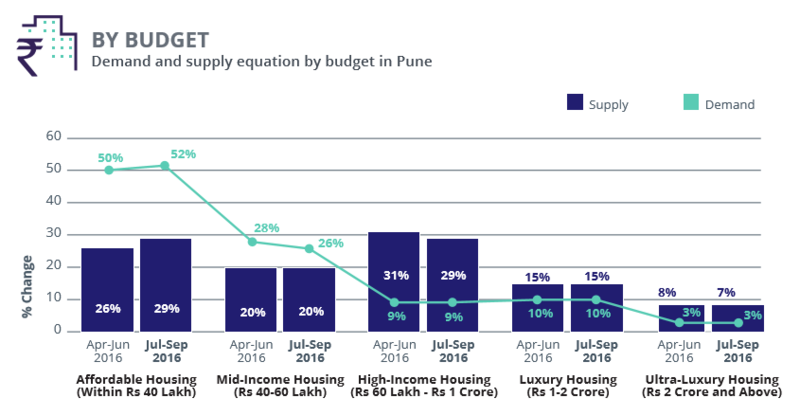 An oversupply of properties priced within Rs 60 lakh and Rs 1 crore is evident in Pune with a 30 percent availability against a feeble 10 percent demand in Jul-Sep 2016. Paradoxically, the budget housing segment (within Rs 40 lakh), which is the most preferred, suffered from a dearth of inventory. 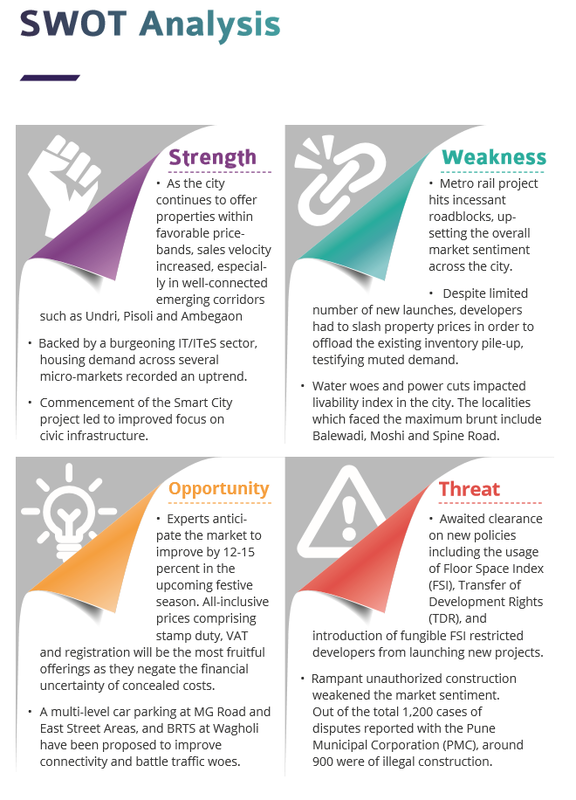 Developers quote unavailability of affordable land, rising construction costs and delays in approvals from local authorities as the primary reasons for the scarcity of low-cost housing projects in the city. For premium segments, on the other hand, the investor base has ebbed further due to weak buyer sentiment and overall grim economic ambience. Properties with 2BHK configuration continued to be the prime choice of homebuyers in Pune. Most of the migrant professionals preferred these units for their economic viability. Supply of larger homes configured as 3BHK and 4BHK units remained unchanged in the last two quarters. 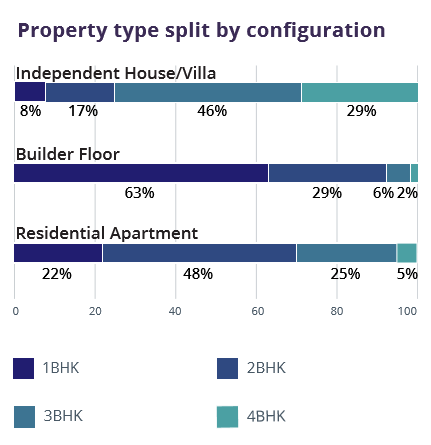 3BHK units captured a quarter of the market share, however, availability of 4BHK was restricted to just six percent. The penchant for affordable housing resulted in a marginal hike in the supply of single-family homes configured as 1BHK units. With developers being incentivised for low-cost homes, industry stalwarts anticipate a budding market for 1BHK configuration in the forthcoming quarters. Out of the total market share of builder floors, over 60 percent were available as 1BHK units. The city saw limited supply of independent houses and villas in this format. 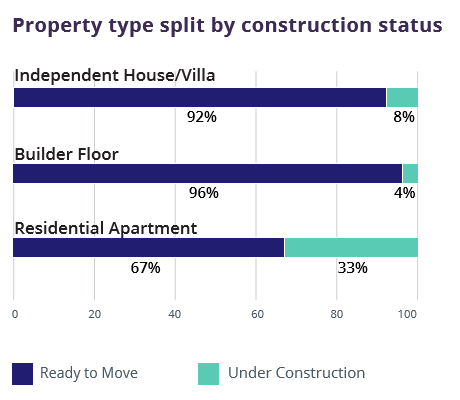 Fear of delayed possessions and untimely deliveries shifted buyer focus to ready-to-move-in properties over under-construction homes. Driven by similar market sentiments as seen in other metros, most of the developers in Pune refrained from launching new projects. 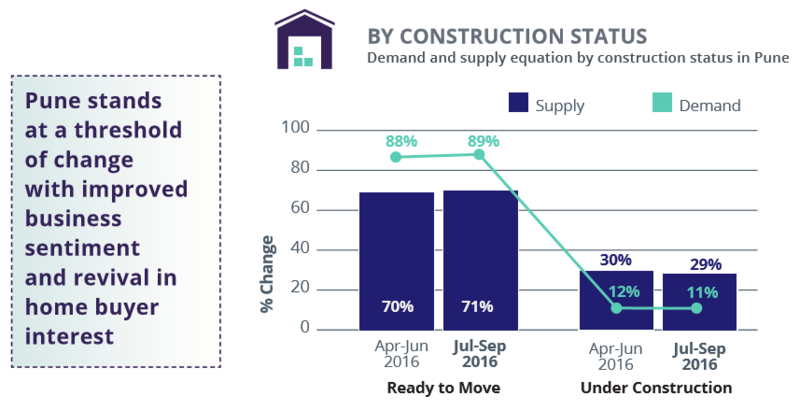 The supply of under-construction inventory in Pune stood at almost 30 percent with a customarily low demand at just 10 percent in Jul-Sep 2016. Most of the under-construction properties were supplied in peripheral locations such as Hinjewadi, Wagholi, Katraj and Vishrantwadi. Residential apartments constituted the maximum concentration of under-construction properties at around 35 percent. The city recorded a marginal increase in supply of ready-to-move-in builder floors. Over 60 percent of these were available in 1BHK formats, followed by 2BHK layouts with approximately 30 percent availability.